DeLena Ciamacco: The Real Estate Expert: OPEN HOUSE IN BUCKEYE LAKE! February 12, 2017 from 1-3 PM! 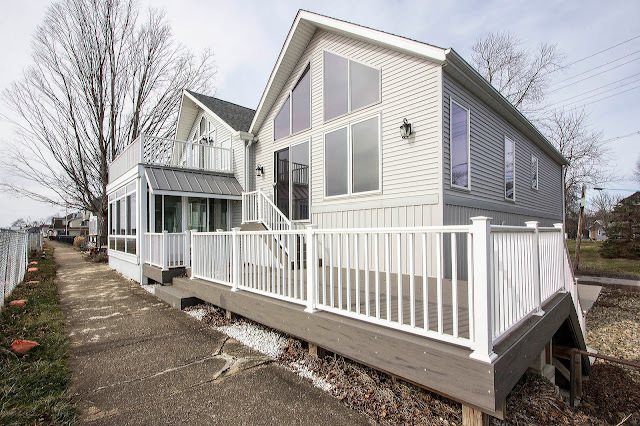 Luxuriously remodeled Two-Story home on a double lot on Buckeye Lake with 4 car garage & panoramic water views! The seller has over $1,000,000 in the renovation/rebuild of this nearly 4,000 SF home in 2015. Live here year round or perfect 2nd home! Very open floor plan with cathedral wood beamed ceilings and walls of windows. Great Room has bar/kitchenette & spiral staircase to Loft. A chef’s “Dream” Kitchen with cherry cabinets, silestone countertops & Stainless Steel appliances. Hearth Room walks out to a Three Season Room. Master’s Retreat has his & hers closets, 2 Full Baths and private deck overlooking water. Huge Media/Bonus Room/Possible Guest Suite. 4 BRs & 4.5 Baths. Lakewood schools. Only $699,900!